Sliced Decorative Timber Veneers Winner ! You are here: Home / Awards / Sliced Decorative Timber Veneers Winner ! 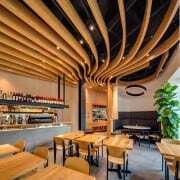 Zanazan Architecture Studio won the Fitout Featuring Sliced Decorative Timber Veneers category of the Australian Timber Design Awards competition for their Lilly’s Espresso e Cucina project. An aspect of Briggs Veneers that we connect with is their ethos to supply quality veneer products made from wood sourced globally from sustainably managed forests and wood-lots. This means that the amount of timber that grows back each year is greater than, or equal to, the amount harvested. In addition, the forests are managed to protect biodiversity, endangered species, water quality and other environmental values. Great news!